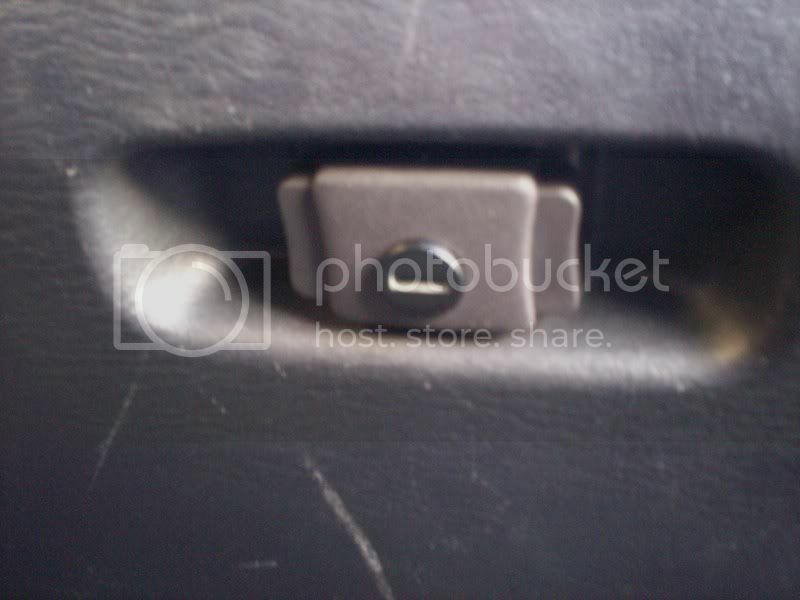 Okay, now I'm not sure who else ever wanted to do this, but I felt gypped when I found out there was a locking glove box and that I didn't have it in my car. You can order one of these from your dealer and have them key it for you, and I'm not sure if there is a charge or not. But it just seems like too much of a hassle, so I decided I'd try and do it myself. I wanted to write this guide as detailed as possible so that anyone who wants to do this can easily do so. 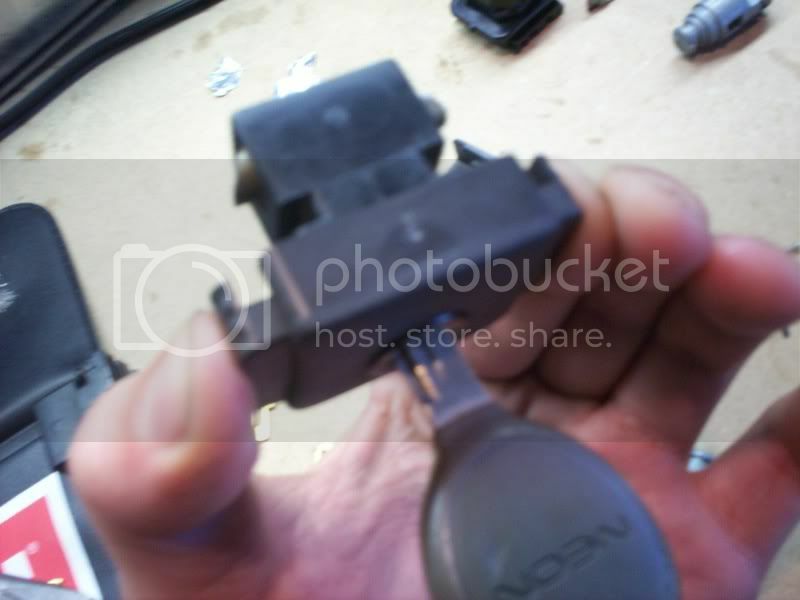 Disclaimer: Just so you know, removing the the lock cylinder from its housing WILL break the tabs that hold it securely in place. I have not found a way to do this otherwise, or to properly fix it. However, the cylinder will still snap back into place and hold, just not as snugly. -At least one locking glove box mechanism, but probably more. This is because you will need the proper cylinder blades(not sure what these are really called), which I will talk about later, to key the cylinder to your key. Not all cylinders will have the blades you need. -1 large and 1 narrow/needle nosed vise grip. -This may not be worth the time to most people. The keying process is relatively easy. The hardest part is probably finding enough of these locking handles. I was very fortunate myself, in that I found four on the same day at the same junkyard. You can choose to order these new, but ordering more than one just to tear them apart seems kind of silly. I'm not sure how much they are new, but they were free for me since I just shoved them in my pocket. lol. -One cylinder may contain the three blades you need, and you won't need more than one of these locking handles. 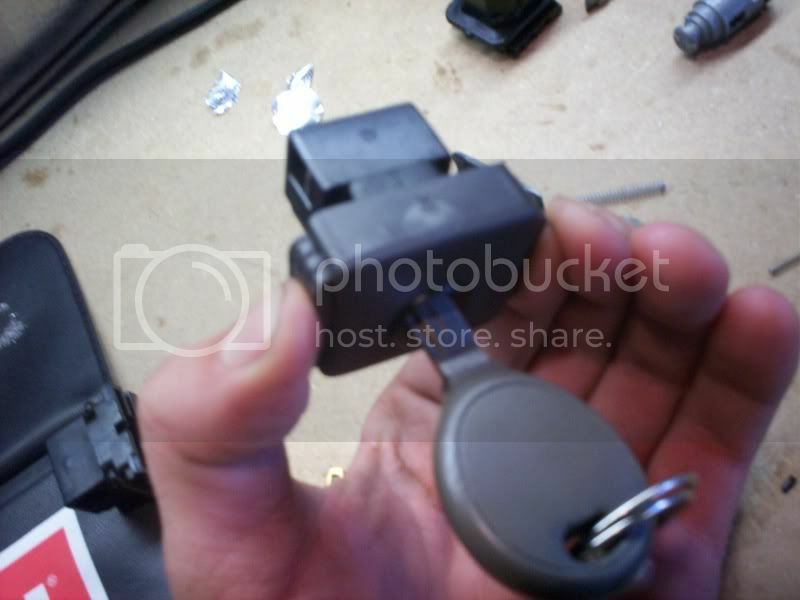 -I am in no way a locksmith, and this process was pretty simple! 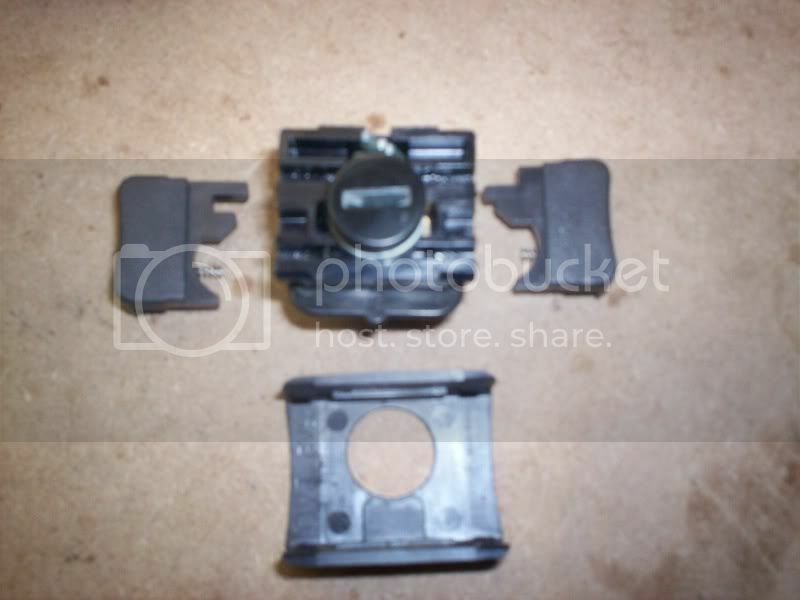 -I'm really sorry about the pics, the camera I used has no macro feature and not even auto-focus..
To remove the locking or non locking mechanism from the glove box, simply remove the U-shaped clip at the base of the mechanism on the inside of the glove box. 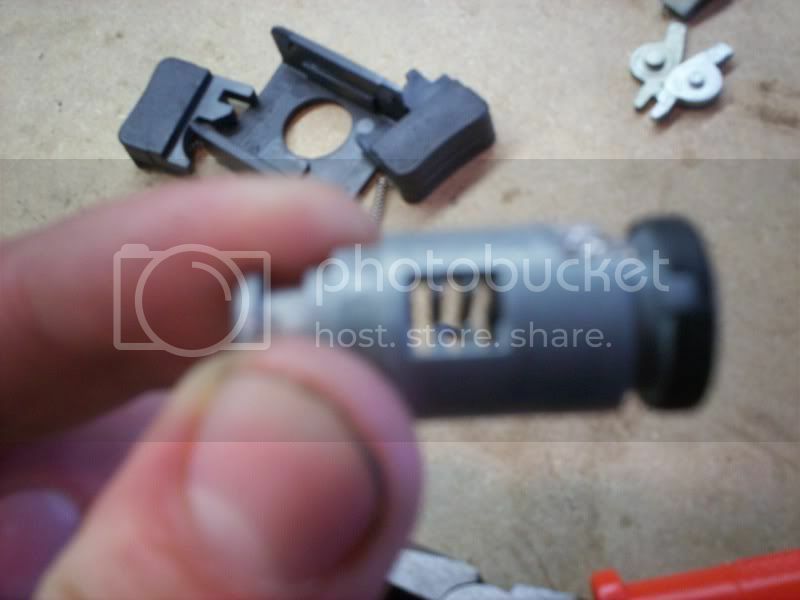 Use pliers or a flat head screwdriver. The whole mechanism will fall out, and you must pinch the buttons to pull it out of the hole. The front cover of the mechanism simply pops off. Lift up either the top or bottom and pull it off. Remove the two pinch buttons on either side if they haven't popped off already. These are not attached and should fall right off without the cover on. Note that there are small springs inside each of these buttons, be careful not to lose these! Now you can see the lock cylinder itself as well as the two cams that drive the close pins at the back of the body of the mechanism. 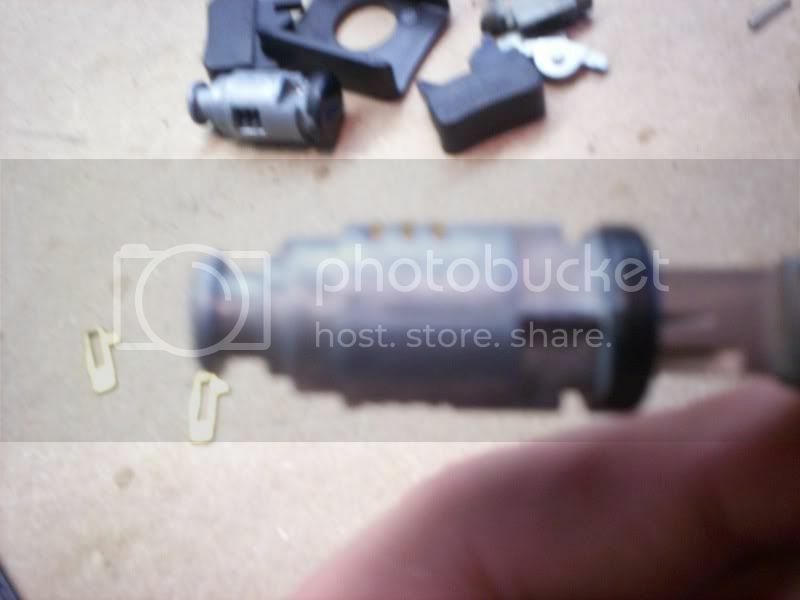 You DO NOT need to remove the cams and close pins as I did. They are not part of the locking part of the mechanism. 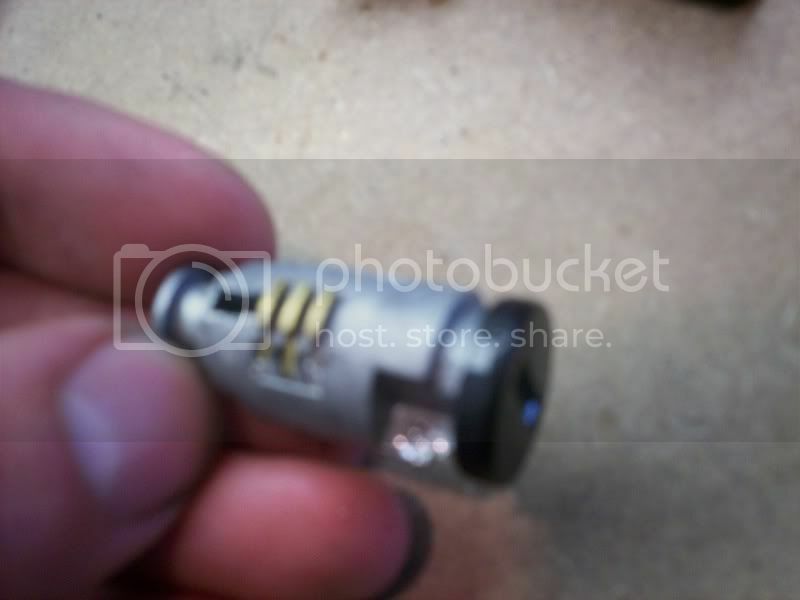 Be aware that the cams could fall out though, in which case the close pins will fall out as well. With your large pair of vise grips, lock them around the base of the body, right below the close pins. Ensure they have a tight grip. 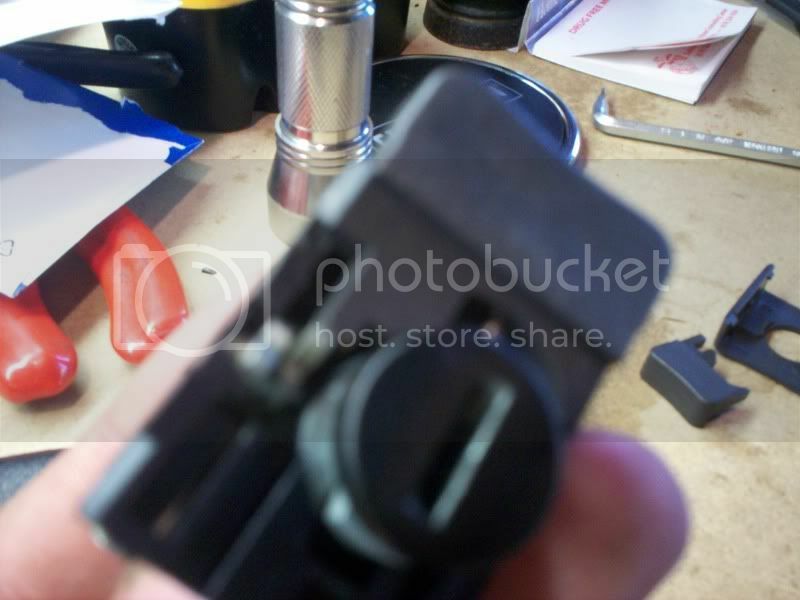 With your narrow nosed vise grips, grab the small tab at the top of the lock cylinder itself. It should be pointed straight up towards the top of the body. Gently but surely, pry the lock cylinder out of the body. This may take some effort, but it will pop out. Note: Of the four cylinders I have, I have only three different lock blades. These blades are numbered 2,3,4, and correspond to the size of the cutout in the blade. Each lock cylinder will have a different arrangement of these blades, which allows them to match the key they were intended for. 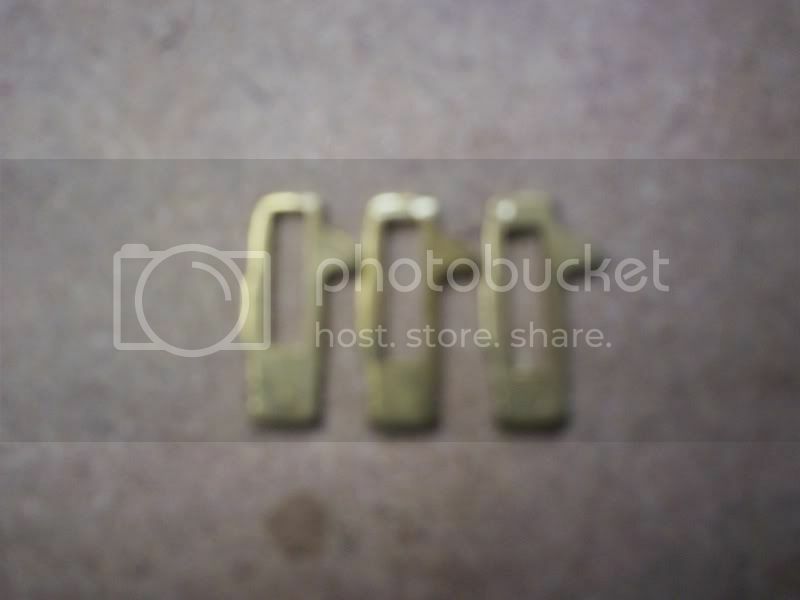 By replacing the blades with the ones needed for your key, we key match the lock and make it usable for your key. There could be more of these blades used out there, but of the four locks that I have I only have 2's, 3's and 4's. The number is printed on the blade itself. 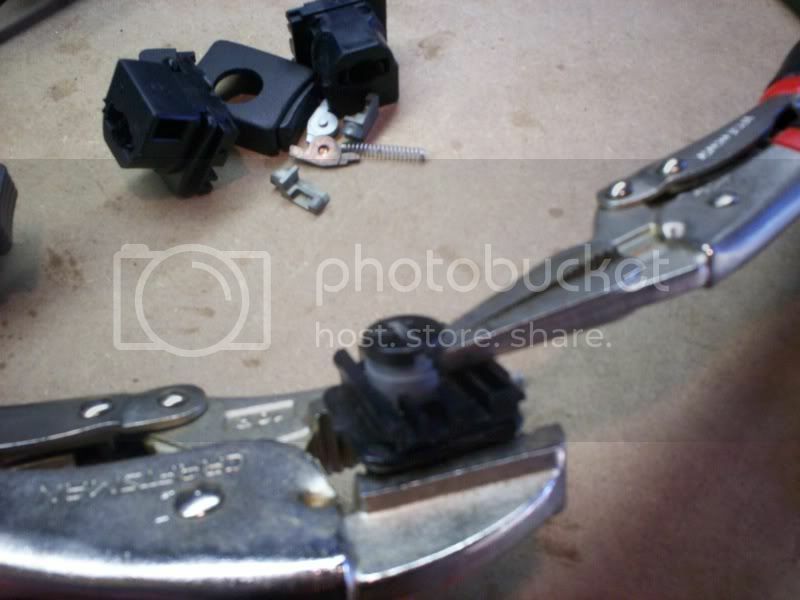 With the lock cylinder in hand, remove each of the three blades by pulling them out with your pliers. They are sort of "locked" in the cylinder, but easily come out when pulled on. Each blade sits in a slot with a small spring inside. Be careful when removing the blades, because the spring can easily pop out and become lost forever on your garage floor. They are pretty tiny. This is the part where you may need more than one lock cylinder. Since not all lock cylinders will have the specific blades you need, you may need to have multiple ones to get the right blades. Matching the blades to your key requires some trial and error. I think I have figured out the blade-key code that's used, however. If you look at your ignition key, you should notice three different "altitudes" on either side, which consist of peaks and valleys. The number on the blades correspond to this elevation on the key, with 2 being shallow, 3 being in the middle, and 4 being the highest peak on the key. This was the case for mine, and I am in no way certain if this is the way for all keys. But I think it is safe to say if there was a 1 or a 5 numbered blade, it would follow this trend. In my case, the code I needed was 2,2,3. So I put those blades in the order according to my key, and voila; the blades become flush with the cylinder when the key is inserted. This is when you know the proper blade order, when each of the three blades are perfectly flush to the cylinder. 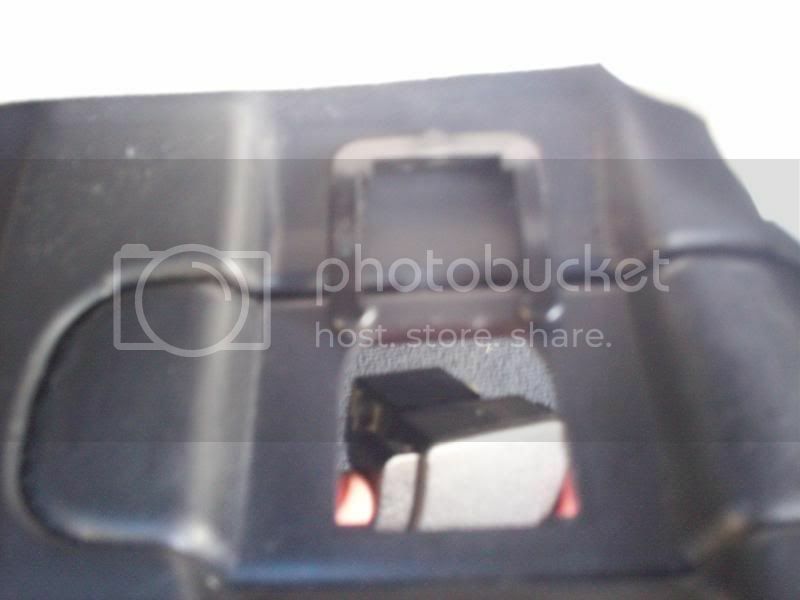 Any protruding part of any blade will not allow the cylinder to turn in the housing, keeping it locked. To insert the blades back into the cylinder, first ensure the tiny springs are in each of the three slots for the blades. Then insert the blades in the proper order for your key. Use pliers to snap the blades into place; they should move freely when properly seated, and spring up when not under pressure. Now with the lock cylinder properly keyed, we can put everything back together and install it into our glove box. Insert the cylinder back into the body, with the tab you used to pull it out again facing upwards. When its pushed all the way in, there should be a satisfying "pop", letting you know it's reached its locking tabs. Now on mine, these broke off to an extent when I removed the cylinder, but nubs were left which still allowed the cylinder to be held in place. On each one I did this with, the tabs repeatedly broke off upon removal. I'm not sure how to fix this short of buying a new, unused housing somehow. Anyway, once the cylinder is back in place, take each of the pinch buttons and pop them back on the body. They are labeled L and R for left and right with the front of the mechanism facing you. 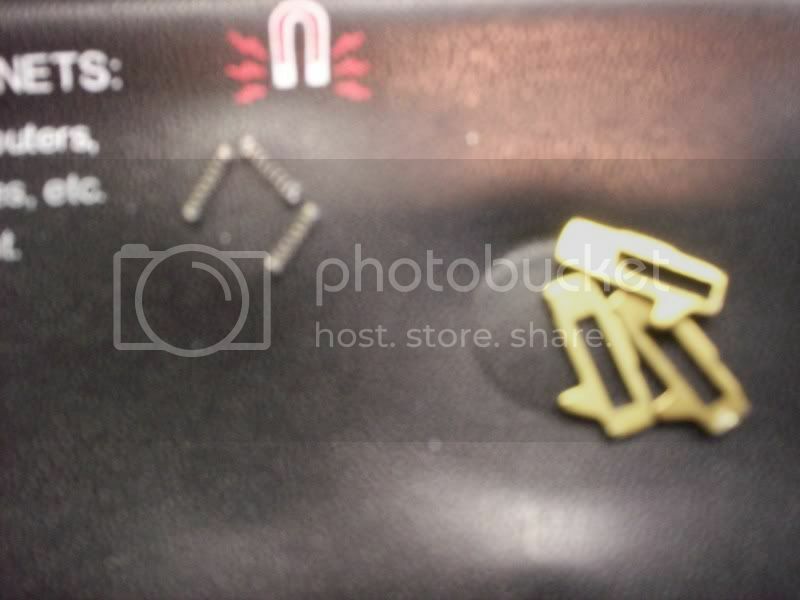 There is a small spring in each button that needs to line up with a cutout on the body, and then a small tab on each that slides on a track leading to their respective cam. Make sure these line up when reassembling. With the buttons back in place, snap the cover back on. It can only fit one way. Be sure to test that the lock cylinder works properly. With the key inserted and the lock cylinder in its unlocked position, the small tab on the cylinder pointed up, you should be able to turn your key a full 180 degrees clockwise. 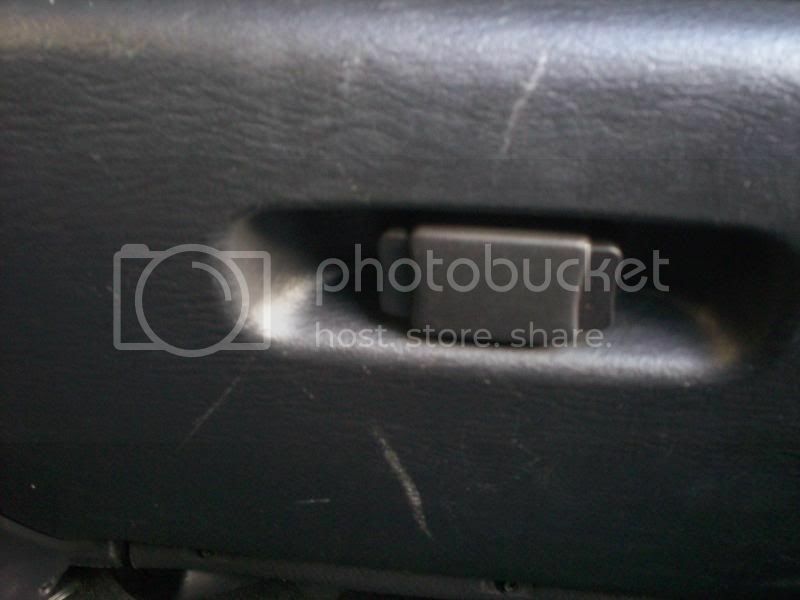 This prevents the pinch buttons from moving inwards and hitting the cams, which prevents the cams from retracting the close pins, which in turn effectively locks the glove box. Now simply insert the locking mechanism into the vacant hole in your glove box, which it can only go in one way, then press the U-clip back around the body. Tah-dah! You now have your glove box lockable to your key! This is kind of extensive for such a simple thing, but for you DIY-ers out there who want this it should be a piece of cake! I hope this was useful. i did this earlier this week and i have a few notes to add so people can understand better. maverick your write up was great im just providing a few hints to keep the cylinder a bit tighter then your way which makes it loose. 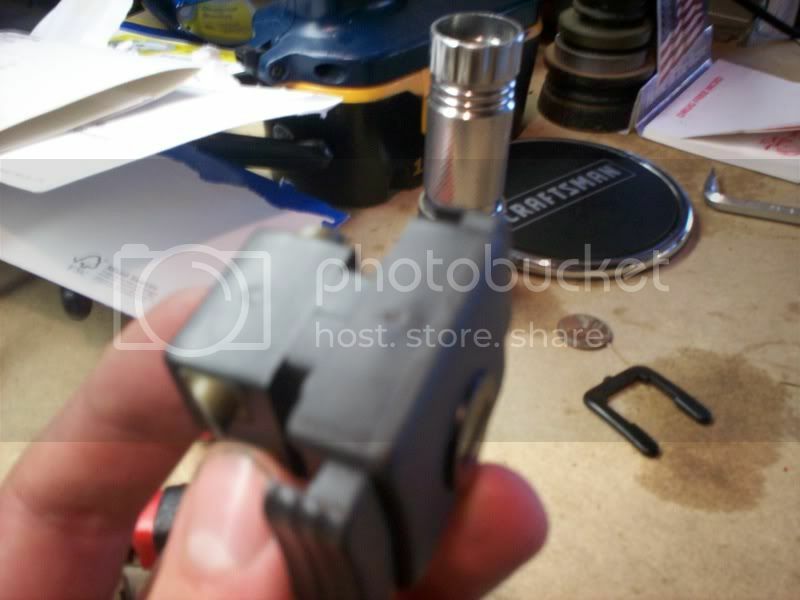 i used this way which is a bit harder to accomplish but it hold the cylinder better when you put it back in. these are the pins i had in my cylinder when i pulled it out. there are in fact 5 different pins how ever i believe most neons use 1-4 hardly and 5 or 1 as well. i said 1-4 because my brothers key uses a 1 i believe. the way to tell what your key code is, is to take it to the dealer for the entire key code so if you need a new starting cylinder and you need it re-keyed you have it. however you can tell your own by looking at the key. the lower the valley the larger number. mine is 4-3-3 because the valley is almost at the center of the key and then moves up one notch. the first hill you see is most likely a 2 because mine and my brothers key tip looks the same, and our codes both started with a 2.
the keying process is fairly easy and takes a matter of minutes like i said before Maverick did a great job with the write up im just adding what i know so more people could have success. lol the key code has like 10 numbers to it. so its 3/10 lol but thanks for the concern. Your key code is 7 numbers. Just saying. Hey stop stealin my key code!! Haha but thanks for the addition, I didn't spend much time trying to figure out how to pull it out without destroying the tabs. Good pics also! thanks and your how to helped a ton too. just tried myself and have to add that I was able to pull the cylinder out very easy and without pliers just by putting the origin key in it, turning to the middle (what fixes the key in the cylinder)and then opened 1st one , then the other hook on the bottom - which are holding the cylinder in place - and gently pulling on the key. Unfortunatelly I found 4,3,2 and would need - for sure - a different code. Any idea where to get some pins anywhere else than at a junkyard ? btw - anyone tried on a gas cap ?? have not tried on gas cap but might be similar, go to a dodger dealership and ask they have a lot on hand or at least mine did where i live. they were free too!